(Phys.org)—A team of researchers working at Sandia National Laboratories in New Mexico has found an explanation for the variety of sounds people hear when witnessing a falling meteor—sounds that should not be heard until minutes later due to the long distances involved. In their paper published in Scientific Reports, the team describes experiments they conducted with transducer materials and what they learned by doing so. Over the years, witnesses of falling meteors have reported hearing a wide variety of noises that appear to come from the rapidly descending fireball. While it is not surprising that meteors would emit noise as they streak through the Earth's atmosphere, it is surprising that they would be heard during the meteor's descent because of the distance. Meteors are generally first noticed as they begin burning many miles high in the atmosphere—and most land equally far away from witnesses. So, how could people hear emitted sounds as they are being made? That was what the team at Sandia Labs sought to answer. The team began with a theory that the noise was not actually generated by the meteor itself, but by nearby objects. They believed the bright light generated by the fireball comes in pulses and that those pulses cause a rapid rise in the temperature of the air through which they travel. The nearly instant air pressure change would result in pressure waves, which would be converted into acoustic waves when they crashed into what the team described as dielectric transducers—heat absorbing objects such as leaves, hair or even a shirt someone was wearing. To test their theory, the researchers studied photographs and video of meteors and plotted the intensity of the light generated. Then they calculated the likely acoustic waves that would result if they struck various objects. Next, they fired similar light pulses at materials to see if noises similar to those reported by meteor witnesses could be heard. They report that such sounds were, indeed, generated, suggesting that their theory was correct—the first to attempt to explain meteor noise due to light. They have called it a "photoacoustic hypothesis." Concurrent sound associated with very bright meteors manifests as popping, hissing, and faint rustling sounds occurring simultaneously with the arrival of light from meteors. Numerous instances have been documented with −11 to −13 brightness. These sounds cannot be attributed to direct acoustic propagation from the upper atmosphere for which travel time would be several minutes. Concurrent sounds must be associated with some form of electromagnetic energy generated by the meteor, propagated to the vicinity of the observer, and transduced into acoustic waves. Previously, energy propagated from meteors was assumed to be RF emissions. This has not been well validated experimentally. Herein we describe experimental results and numerical models in support of photoacoustic coupling as the mechanism. Recent photometric measurements of fireballs reveal strong millisecond flares and significant brightness oscillations at frequencies ≥40 Hz. Strongly modulated light at these frequencies with sufficient intensity can create concurrent sounds through radiative heating of common dielectric materials like hair, clothing, and leaves. This heating produces small pressure oscillations in the air contacting the absorbers. 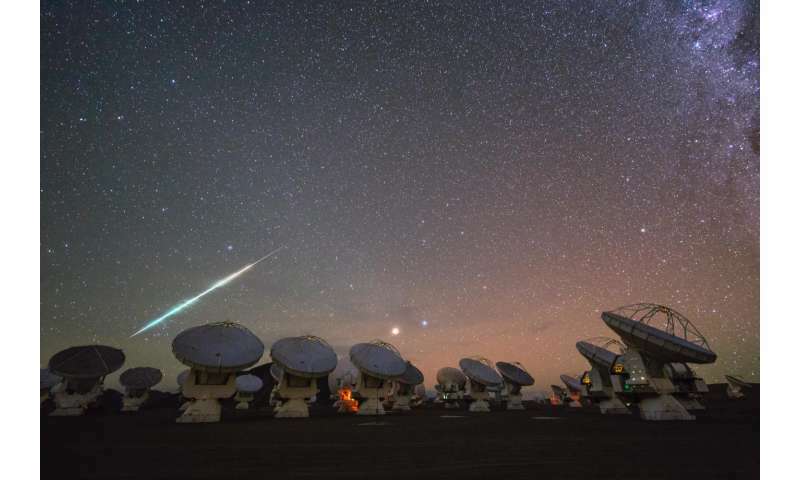 Calculations show that −12 brightness meteors can generate audible sound at ~25 dB SPL. The photoacoustic hypothesis provides an alternative explanation for this longstanding mystery about generation of concurrent sounds by fireballs. Them charged meteors are interacting with the Electric Earth. That which is a mystery to some becomes obvious when the correct discharge mechanisms are considered. I have heard this standing on the dock at my cottage. It wasn't until the next day that I thought that the sound would be impossible and my brain must have just made it up! Seems it was a real sound after all!